I apologize for not posting something here more regularly over the past eight or nine months. Lots of things going on. Still working on Book 4, tentatively titled Maelstrom Within. It’ll be a bit darker for Diomedes than the previous three, but if you’ve read Rebellion Reborn, you’ll know why. If you haven’t, well then shame on you. Go read it! The first image is of a logo I’ve been messing around with for a while. Needed something for the Metis Foundation. I think its pretty cool! Any thoughts? 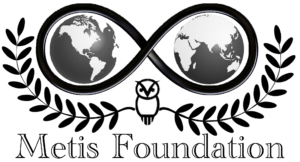 Yes, the infinity symbol has to do with Metis, while the owl is associated with Athena, of course. The olive branches are for peace, since that’s what the Metis Foundation is all about, and the globe represents the scope of operation! So there you have it! The second image is a bit more complicated…. Diomedes modern coat-of-arms so to speak. 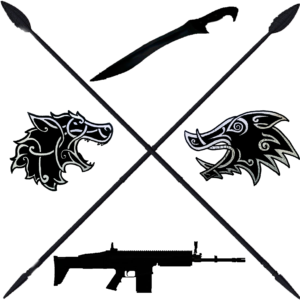 The wolf is the symbol of his homeland–Argos, while the Calydonian boar is the symbol of his family. The modern weapon at the bottom offsets his traditional weapon at the top, his kopis swords. The two spears just divide it up, but they can be seen as the Pelian spear he took from Achilles when he died. Again, whatcha think? Not sure what I’ll do with them, but I think they’re cool!